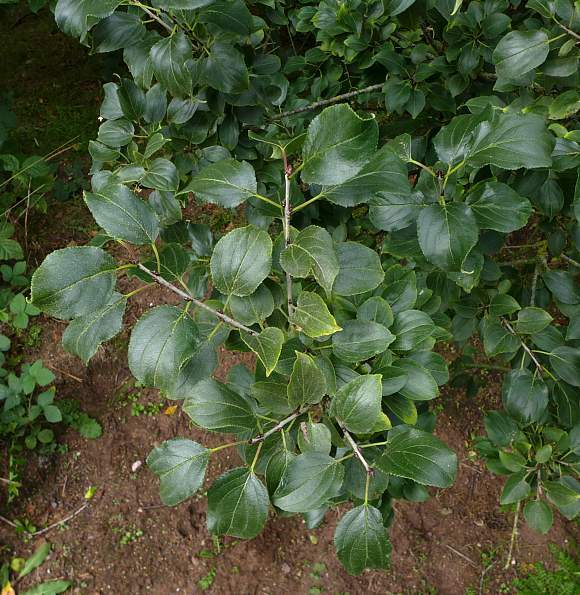 A deciduous spiny shrub growing up to 8m in height. 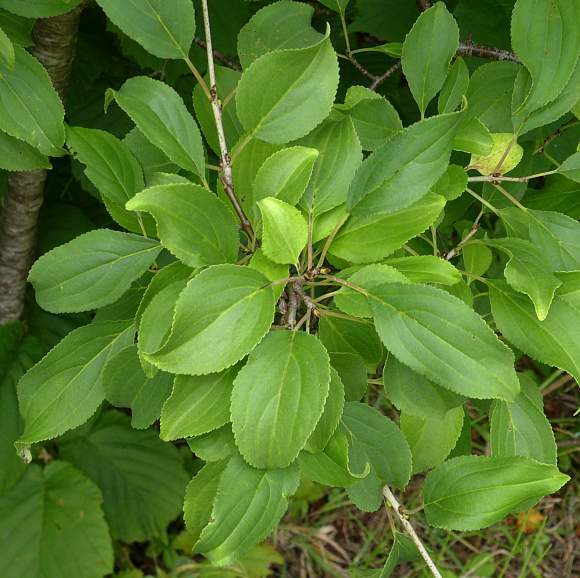 The leaves vary in size from 4 to 9cm and are usually a dark green. New growth atop is greener than the older leaves below. 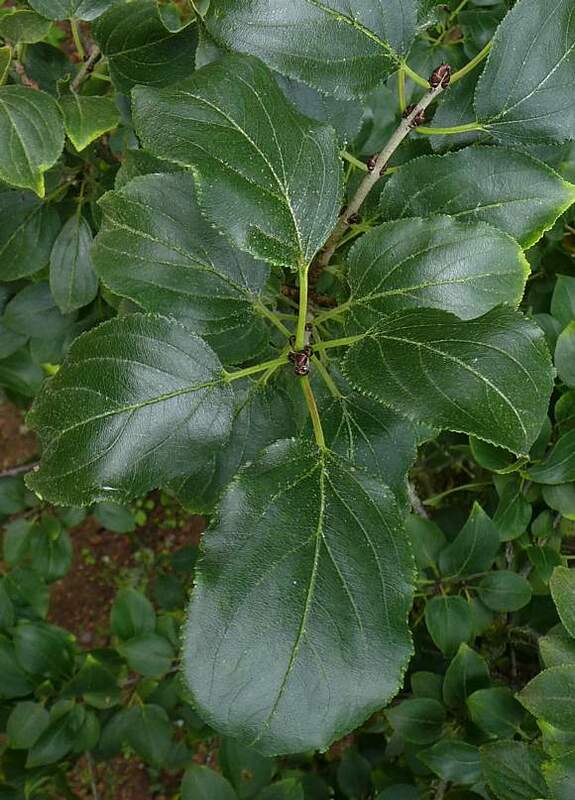 Many leaves opposite each other, and at alternate angles up the stem. Not all leaves are opposite though - look near the bottom. Not all leaves are opposite. Normally the flowers are more numerous than this. 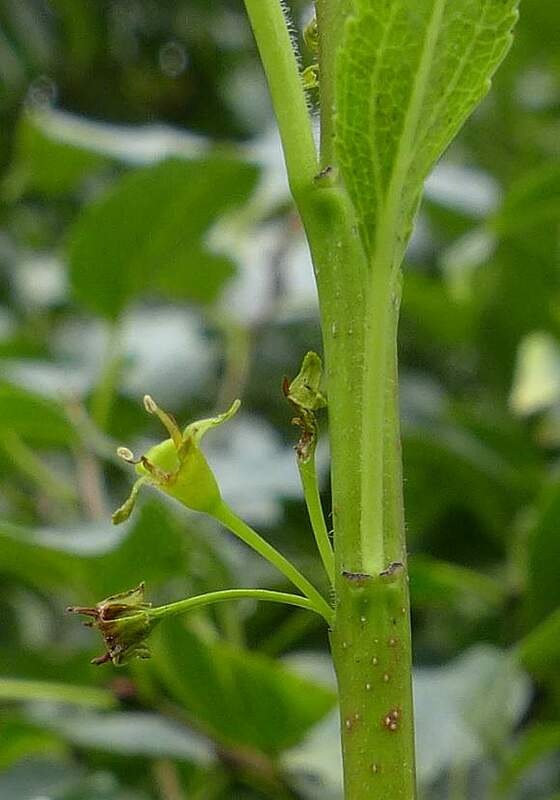 They have flower stalks which are between 6 to 25mm long with a narrowly-cupped sepal tube with usually 4 green sepals and 4 petals - the latter are free. 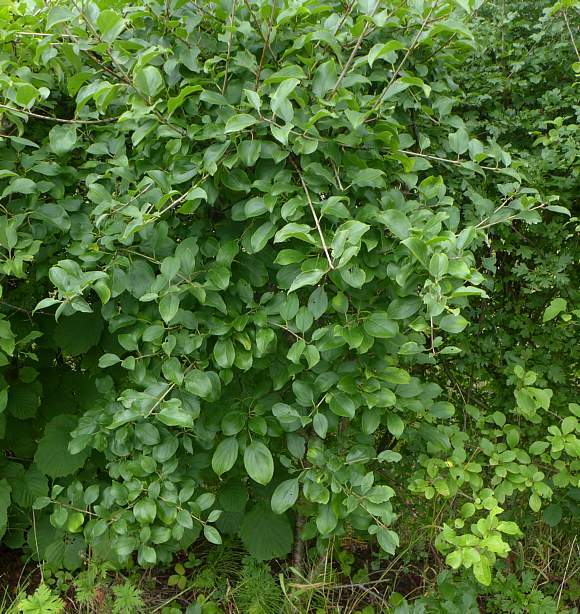 Purging Buckthorn is Dioecious, having separate male and female plants. The one at Moore here has anthers in the flower (centre left) and therefore must be a male plant and therefore this particular shrub will not bear the blackish berries. There are normally 4 anthers. The flower stalks emerge from near the top of a sheath around the stem. The flowers in this photo are well past their best. After flowering the poisonous black fruit appear. 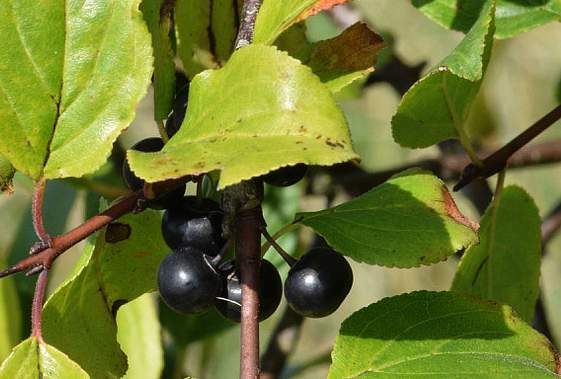 The berries are almost black and in groups close to the stems. Even their stalks and discoidal attachment are black. 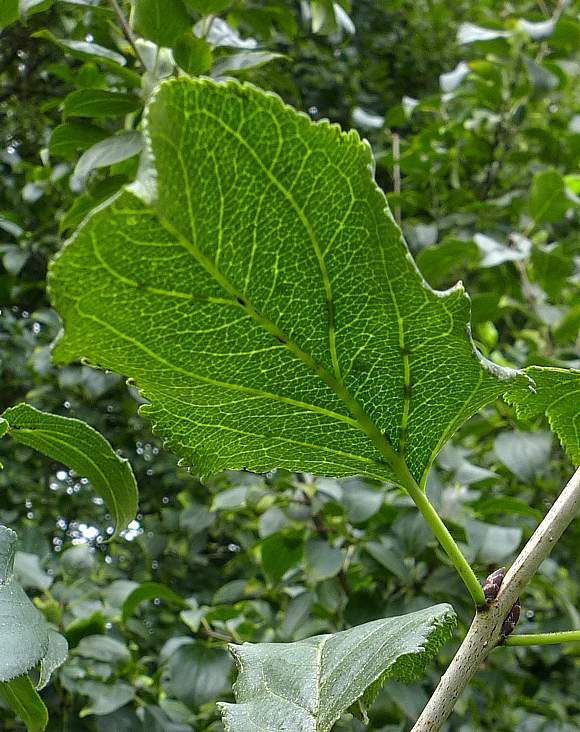 The leaves have between 2 to 4 main pairs of curved lateral veins, sometimes up to 5 pairs. 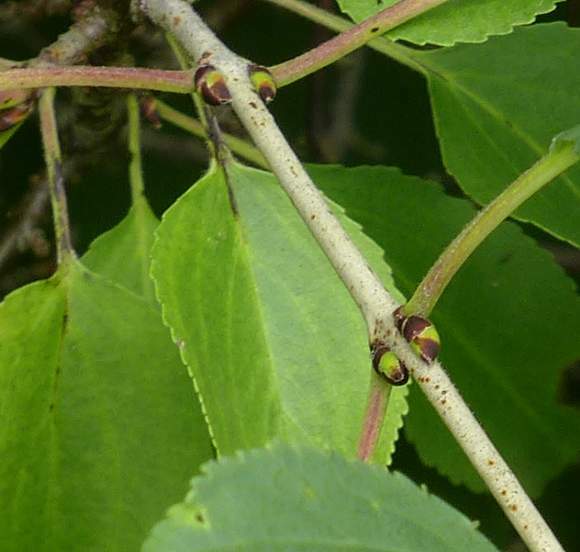 New branch buds are forming in the leaf-stem axils. 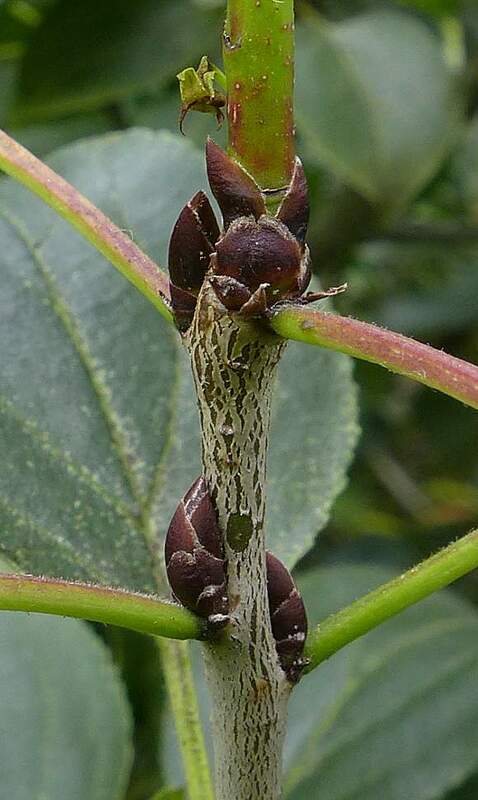 New branch buds forming in leaf-stem axils. 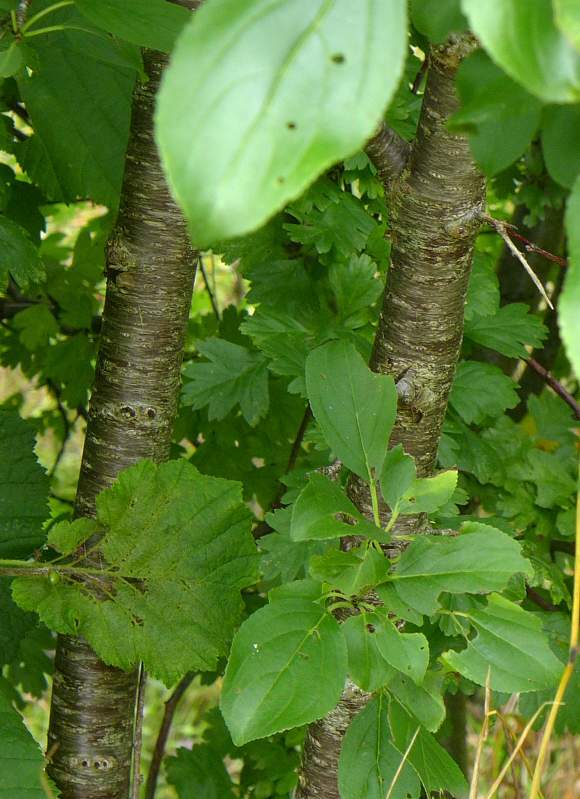 The stem is expanding in girth stretching the greyish papery bark leaving gaps. 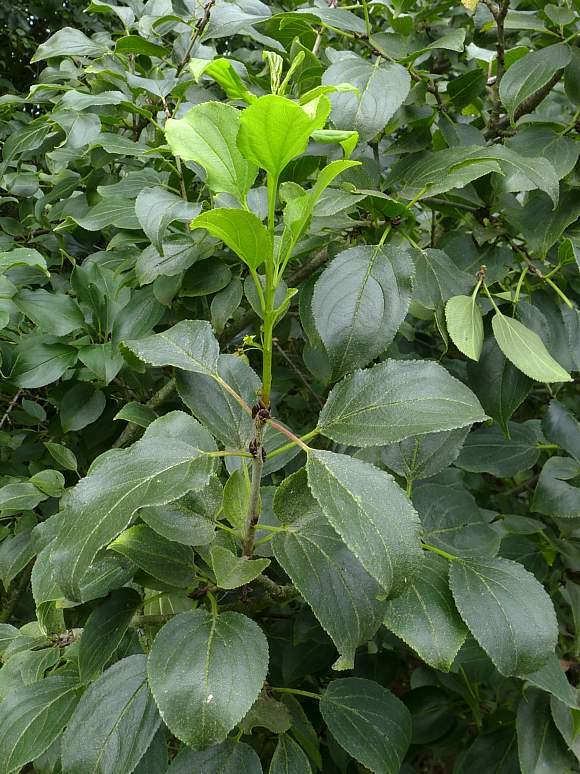 Younger or leaves not in full sun could be paler green. Upper surface a darker green than under-surface (see below). Veins indistinct from upper surface. Under surface a paler green than upper surface (see above). 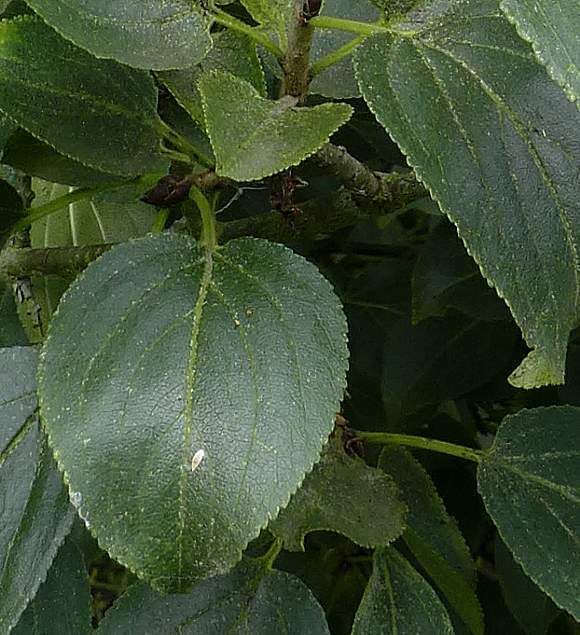 Veins prominent on underside of leaves and the much smaller connecting veins can also be seen as a fine darker-green interconnecting network. Smaller veins numerous between main veins. The leaf teeth are numerous, tiny and blunt. 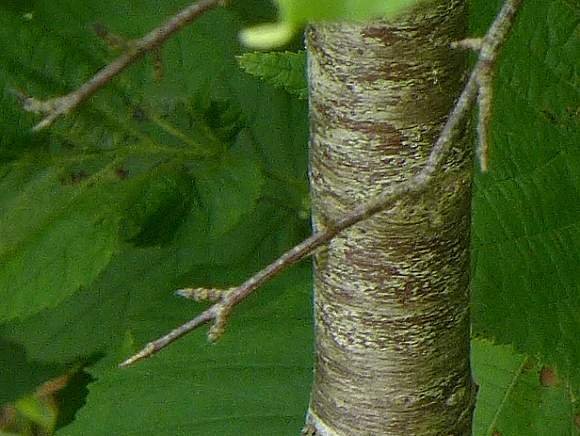 The bark with an interloping leaf on the left. 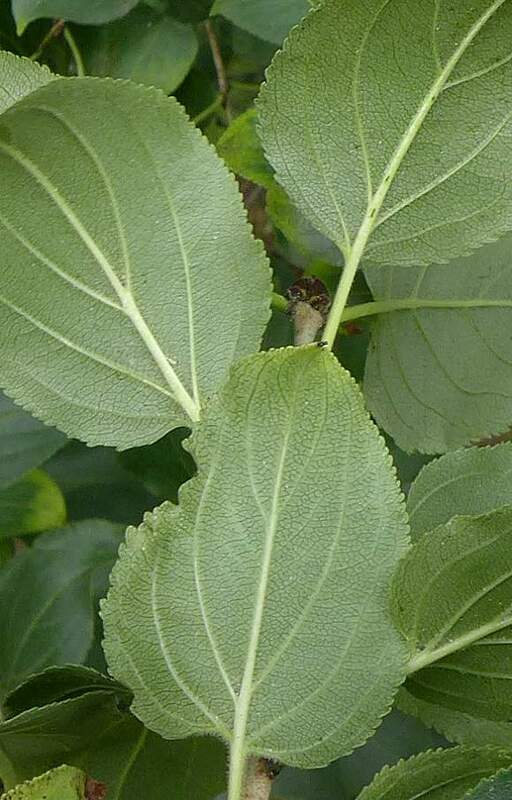 Unlike Alder Buckthorn there are spines on the shrub, but they are not all that numerous and hard to spot on their thin twigs. Not as harmful as those on Blackthorn or Sea-Buckthorn! No relation to : Sea-Buckthorn (Hippophae rhamnoides) a spiny shrub found near the sea with bright orange berries [a plant with similar name belonging to a differing family]. 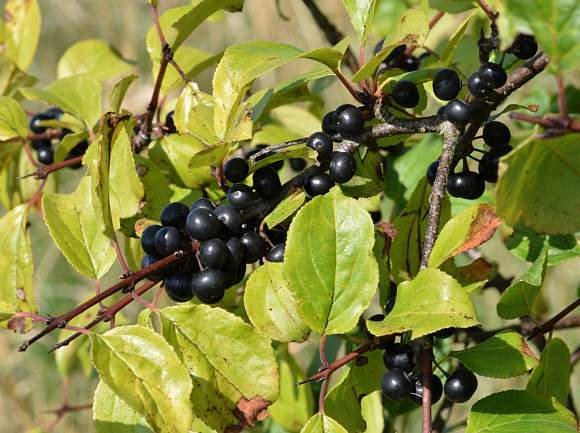 If the berries are consumed, they are mildly toxic, causing almost immediate violent stomach cramps, regurgitation and a laxative effect. It is said that both an Aglycone AnthraQuinone (without any glucosides) and Emodin in the berries are responsible for these symptoms. Emodin acts as an anti-microbial protecting the fruit from bacterial and fungal attack. The concentration of emodin diminishes as the fruit ripens. The specific epithet cathartica eludes to these properties. 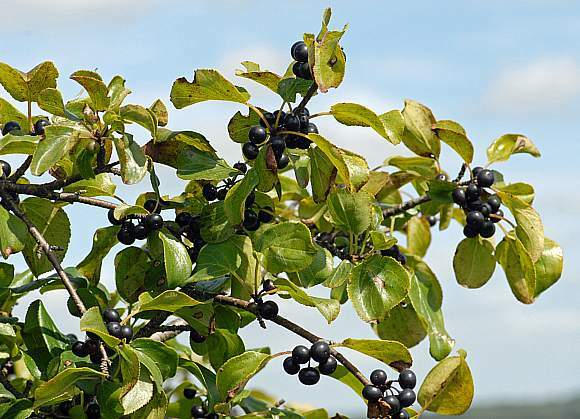 It could be that the mild toxins dissuade birds from eating the unripe berries, but allow them to eat ripe berries without too much trouble. 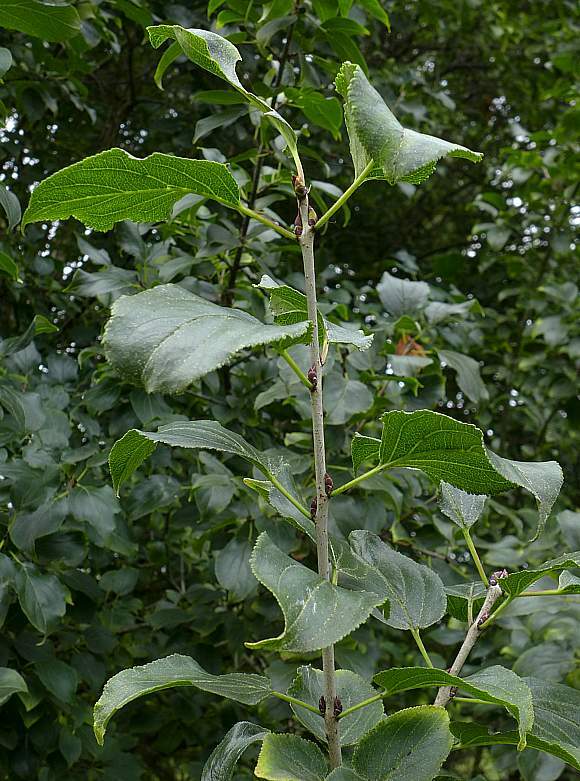 Buckthorn is distributed by birds after consuming the fruit and subsequently excreting the seeds undigested. 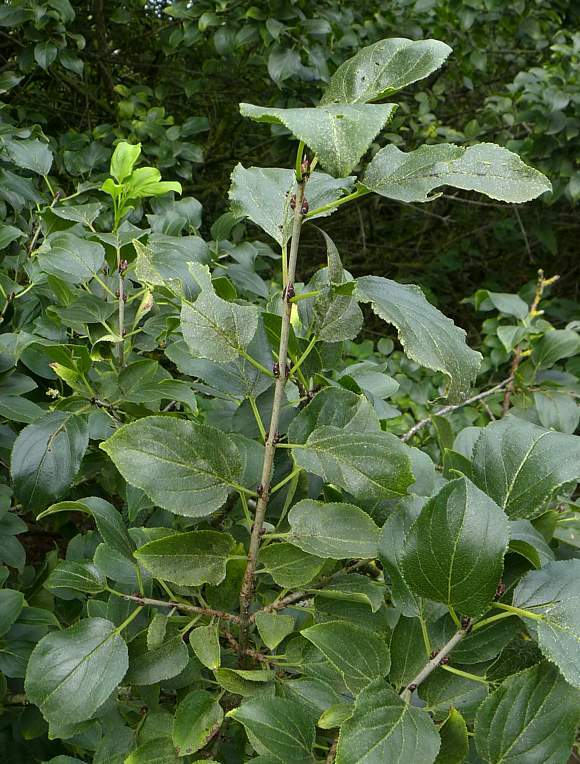 It is found especially on lime soils in scrub, hedges, woods and fens but also on peat soils. It is native.